hey i tried the link on page one and it didnt work??? where else can i find it? or how else can i see this? yeah im looking for this too, where can i find it? Look at post 203 I believe it is, only 3 or 4 above this one and there is a link. I just clicked it and printed it out. WOW! We have a whole thread full of morons that can't seem to read and want someone to do all their work for them, so they post dumb **** to the thread making it even harder to find the links. FWIW, there are a few links posted in this thread that work, including mine still works, I wish a mod would just make this a sticky and then lock it to prevent more posts. post 143 works also...just tried it. Thanks for putting the link to this up. The old links would not work. Here is the full PDF version(6.49MB file) WITH the page seven top right hand corner 24lb/hr fuel injector typo fix to 22lb/hr. PS I don't know much about MediaFire, but I hope they keep the file permanently. Actually it's not that easy. My iPhone will open your link, but once I click on the "download", my iPhone kicks me out of Safari. But when I click on my link, the pages load up. I believe my links are more user friendly on all operating platforms and devices that utilize web browsing software. Just saying. It must be that your iPhone is outdated by a lot or you need to do a restore back to factory settings on your iPhone. Maybe try to delete your cookies? It works perfect on my iPhone(iPhone 4 GSM iOS 5.0.1 running on WIFI.). Problem must be the iPhone itself. I got a 3G with the crappy battery life which is associated with the updated iOS 5.0.1... O'well. 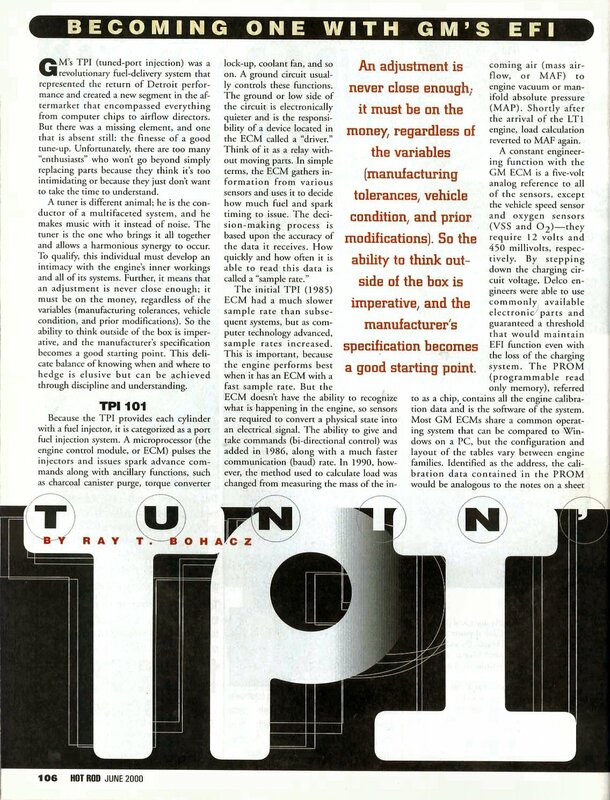 Was just wondering if anyone still had the "TPI tuning article" layin around. The link is no longer working, and with me being a newbie it would come in very handy. Thanks in advance. RIGHT HERE, BRO! RIGHT ABOVE YOU! Does anyone still have the article that is being talked about cause none of the links are working any more? Do you understand how to be constructive? I'm not surprised your from the district of criminals. It would NOT surprise me if you thought of your self as a "thug". Not saying that you do, of course, just wouldn't be shocked....you know. Okay guys. No arguing, unless you wanna end up with a status like mine. Was just browsing through the TPI forum as I am having some issues on my GTA Im trying to figure out. None of the links seem to work from this post. Can anyone re-post or send me this article? Check the post above from 'Chevy86 IROC-Z' with the photobucket link. I just printed it out and read it. Thanks! That was a good article to start reading. I am new to the whole tuning world but know that it is time to start learning. I have had my 89 Firebird rebuilt almost 14 years ago and have never done a single thing to the ECM. It is a 350 bored .030 with Isky cam ,can't remember specs, running about 10.1 compression. It has stock heads that are going to get changed in the near future and is running a Holley Stealth ram intake with shorty headers and single 3" exhaust, no cat. I think it is time to get the computer up to date. Is this no longer available? My system says it can't access it. Thank you Ukprocharger for pointing me in the right direction! Thanks Chevy86 IROC-Z for the photobucket link...seems to be the only one that works. Thanks Crossfire for keeping that data alive. LOL, I was just trying to figure out why my weekly stat counter for my blog that I haven't posted anything to in years is way up... I guess you guys have been going over there. That page is averaging 50 hits a day mostly from traffic linked to here and a corvette forum. Your link is broke. Can't access it.